Windjammer Landing Villa Beach Resort is an independent and family friendly property, set within 60 acres of hillside overlooking La Brelotte Bay on the northwest coast of St Lucia. Whitewashed paths lead down the hillside through tropical gardens, allowing guests to wander from there down to the beach for the day before taking the shuttle service back to their accommodation. 158 spacious rooms, suites and villas occupy Mediterranean-style buildings within beautiful surroundings, many with stunning views of the Caribbean Sea. Accommodation options suit a variety of guests’ requirements, allowing them to stay on the board basis of their choice including self-catering. Rooms have a variety of outdoor options including private terraces, sun decks, plunge pools, private Jacuzzis and even full size pools. Windjammer Landing offers a range of dining choices in five restaurants. Dragonfly serves the finest Caribbean cuisine while Papa Don’s Taverna opens for dinner and offers a Mediterranean atmosphere with pizza and pasta dishes. The Upper Deck serves seafood and steak, Embers makes the most of its beachside location for delicious BBQs and Jammers Beach Bar & Grill offers casual, all day dining with live music in the evenings. In-villa dining where the chefs prepare a gourmet treat just for you is available for the ultimate in luxury. During your stay at Windjammer Landing you can make the most of the resort’s facilities which include three adult-only swimming pools, three children’s swimming pools, tennis courts and a fitness centre. Watersports include Hobie Cat sailing, water skiing, wake boarding and banana boat rides. The new spa offers a range of treatments in an idyllic setting, with facilities including a juice bar, relaxation room and wet rooms. Golf is available nearby with transport included in the green fees. Both golf and spa treatments are chargeable locally. Windjammer Landing Villa Beach Resort is a fantastic choice for families. A nanny service can be arranged before guests even arrive at Windjammer Landing to give complete reassurance that the very youngest of guests will be looked after. Jacquot Fun Club is open for children aged between 4 – 12 with a programme of supervised, fun activities while there is a Teen Activities programme for older ones! Windjammer Landing offers a fantastic range of excursions and tours through the concierge team to help you explore the island of St Lucia. Enjoy cycling tours, fishing, zip lining, boat trips, scuba diving, shopping, bird watching, Fish Fry Fridays or visit the Caribbean’s only drive in volcano. St Lucia is an incredibly active island with a huge range of activities available – we encourage you to get out and explore! For more information about Windjammer Landing or alternative resorts, take a look at Su's St Lucia Trip Diary. On arrival at Windjammer the first thing that struck me was the view - the bay really is very pretty with the accommodation spread out across the hillside to take full advantage! The resort has a great selection of accommodation to suit everyone from couples to families to groups and the new North Point villas really are a great addition. Located right next to the beach, they are in the heart of the resort and are of a very high standard giving you luxury accommodation with the freedom to self-cater while still on a resort. I loved the feel of Windjammer - there was a real buzz with lots of activities taking place for all ages including a great selection of watersports included on the all inclusive plan. The pool area was spacious and close to the beach, and I loved Jammers for lunch! With a number of restaurants available throughout the resort you certainly won't go hungry and there are no restrictions on the all-inclusive plan so you can take full advantage of all dining options. The accommodation is spread out, but the resort doesn't feel too big, and with the resort shuttle running at all times it's not a problem to get around. I think this is a benefit as you can be in the thick of it down by the beach and pool, or enjoy the views and peace and quiet from your villa - whatever suits your mood! Highly recommended for those who like the feel of a resort but also want spacious, private accommodation! 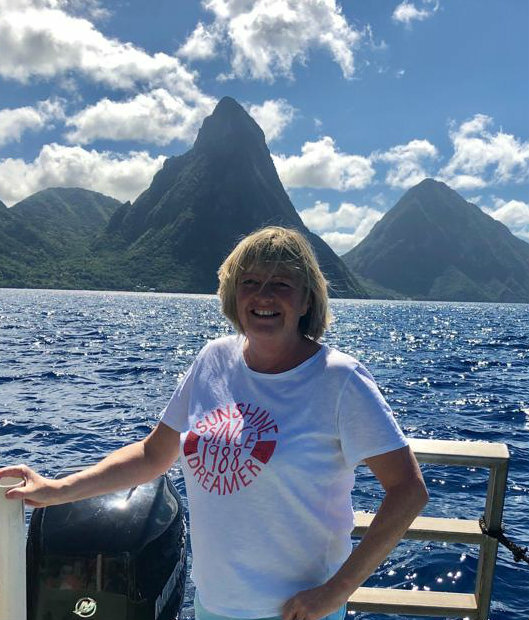 For more information about Karen's trip to St Lucia, take a look at Karen's St Lucia Trip Diary. Children: Windjammer Landing is extremely accommodating towards children and their needs. With a complimentary children’s club (running through to the evening), babysitting (charged locally), children’s menus in many of the restaurants and a huge range of activities to keep them entertained. Cots and high chairs are available. Distance from the airport: Approximately 1 hour and 30 minutes by car from Hewanorra International Airport. To get there in style, helicopter transfers are also available between Hewanorra International Airport and George F.L Charles Airport, taking approximately 10 minutes plus a drive of about 20 minutes between the airport and the resort. Helicopter transfers cost around £150 each way - ask our Caribbean specialists for more information. Location: Windjammer Landing is set on Le Brelotte Bay on the northwest coast of St Lucia - just 5 miles from St Lucia’s capital, Castries. Serenity Spa: The Serenity Spa at Windjammer Landing offers a range of treatments such as massages, facials, body wraps, manicures and pedicures. Facilities include a range of treatment rooms, a steam room and a wet room. Spa treatments are payable locally. Facilities: Six swimming pools, five restaurants, a range of bars, complimentary watersports (both motorised and non motorised), tennis courts, a fitness centre with complimentary classes, a spa, concierge service offering car rental, tours and more, a 24 hour villa shuttle, a mini mart, room service and a boutique shop. Guests will be provided with beach towels daily - these can be collected from the towel hut. Dress Code: Guests of Windjammer Landing are asked wear shoes and to cover their swimwear when dining in Dragonfly, Jammer's Bar and Restaurant and Embers. After 5.30pm guests are asked to dress respectfully - with collared shirts for men. Meal Arrangements: You can opt to stay at Windjammer Landing on a room only, bed and breakfast, half board or all-inclusive basis. All-inclusive includes breakfast, lunch, dinner, both alcoholic and non-alcoholic drinks, watersports and tennis. Nightly Entertainment: There is a range of nightly entertainment including the manager’s cocktail party on Tuesdays. Check In/Out: Guests are invited to check in at 3pm and check out at 11am. Internet: Guests are offered complimentary Wi-Fi in public areas, villas, suites and rooms. Rental car/parking: Complimentary on-site parking; private villas have parking on their driveway. Windjammer Landing’s concierge team will be happy to arrange car rental for you. The accommodation at Windjammer Landing is split between rooms/suites and private villas. All options feature air conditioning in the bedroom, WiFi, a balcony or patio, bathrobes, a mini fridge, coffee maker, a hairdryer, flat screen TV, telephone and safe. Ocean View Guestroom: These luxury rooms feature a queen size bed and balcony with ocean views. Maximum occupancy: 2 persons + additional cot (560 sq ft). One Bedroom Ocean View Villa: These villas include a full kitchen, a separate living room with sofa bed, a king or queen size bedroom, a bathroom with shower, plus a private patio and balcony with ocean views. Maximum occupancy: 4 persons (up to 2060 sq ft). Ocean View Two Bedroom: These rooms are similar to the Ocean View Guestrooms with the addition of a second twin bed. Maximum occupancy: 4 persons + additional cot (985 sq ft). Premium One Bedroom Ocean View Villa: These villas feature a full kitchen, a separate living room with sofa bed, a dining area, a king or queen size bed, a bathroom with shower and freestanding bathtub, and an ocean view terrace with private plunge pool. Maximum occupancy: 4 persons (up to 2060 sq ft). One Bedroom Oceanfront Suite: These suites feature a full kitchen, a separate living room, a king size bed, a bathroom with shower and bathtub, and an oceanfront terrace with hot tub. Maximum occupancy: 4 persons (941 sq ft). Two Bedroom Oceanfront Suite: These suites are similar to the One Bedroom Oceanfront Suites but with the addition of a second king size bedroom with a separate en suite bathroom. Maximum occupancy: 6 persons (1385 sq ft). Premium Two Bedroom Ocean View Villa: These villas are similar to the Premium One Bedroom Ocean View Villas but with the addition of a second bedroom with twin beds. Maximum occupancy: 6 persons (1875 - 2350 sq ft). Premium Three Bedroom Ocean View Villa: These villas are similar to the Premium Two Bedroom Ocean View Villas but with the addition of a further king size bedroom . Maximum occupancy: 8 persons (2375 - 3357 sq ft). Premium Four Bedroom Ocean View Villa: These villas are similar to the Premium Three Bedroom Ocean View Villas but with the addition of a further bedroom with twin beds or a queen size bed . Maximum occupancy: 10 persons (up to 2495sq ft). Luxury Two Bedroom Beachfront Villa (formerly known as North Point Villa): These villas are just steps from the beach and feature a full kitchen, an enclosed living room with sofa bed, a dining area, a king size bedroom, second bedroom with two queen size beds, and a bathroom with shower and bathtub. Outside there is an outdoor living area, a private pool and a rooftop mini kitchen. Maximum occupancy: 6 persons (up to 2100 sq ft). Luxury Three Bedroom Beachfront Villa: These villas are similar to the Luxury Two Bedroom Beachfront Villas but with the addition of an extra bedroom with two queen size beds. Maximum occupancy: 12 persons (up to 2700 sq ft).